Light + Building, Frankfurt, Germany – Philips (NYSE: PHG, AEX: PHIA), the global leader in lighting, and Saint-Gobain Ecophon, a global supplier of acoustic systems will launch a transformational new version of their jointly developed light-emitting acoustic ceiling. The new SoundLight comfort ceiling tunable white enables dynamic lighting, supporting the human body’s natural biorhythm to aid wellbeing and productivity. It is based upon the known benefits of SoundLight comfort ceiling launched in 2012. SoundLight comfort ceiling tunable white incorporates programmable lighting controls that change the brightness and warmth of office lighting throughout the working day. This supports employees’ energy levels, which can be diminished by spending too much time indoors. SoundLight comfort ceiling tunable white helps to reverse this by simulating ‘daylight inside’ and helping to maintain the body’s natural connection to the sun. 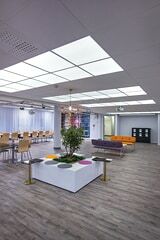 “Saint-Gobain Ecophon and Philips jointly developed and released SoundLight comfort ceiling in 2012. Now with dynamic lighting we take the next step towards an optimum working environment when it comes to light and sound absorption, enabling people to perform at their best and keep the balance in their biorhythm.” said Gert-Jan van Doormalen, President of the Ecophon Group. The light-emitting ceiling also enables a more stimulating, inspiring and attractive open plan office environment by limiting ceiling clutter and creating the impression of a bigger space – while its acoustic nature minimizes noise disturbance. It is easy to install in either new or existing offices. Ecophon is a global supplier of acoustic systems that contribute to good room acoustics and a healthy indoor environment with the focus on offices, education, health care and industrial manufacturing premises. Ecophon is part of the Saint-Gobain Group and has sales units and distributors in many countries.